The PosiCharge™ DVS are premium intelligent fast chargers designed to handle multiple shifts for round-the-clock performance for the hardest working forklifts in the fleet. 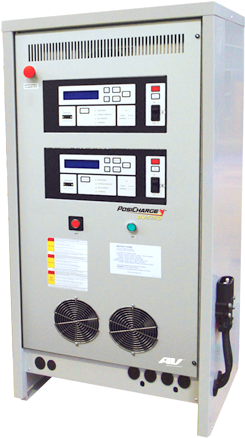 The PosiCharge™ DVS100 is a premium intelligent dual-port charging system that can supply 200A/port with maximum efficiency, and is a lower cost alternative in locations where trucks are parked in pairs. The DVS100 offers an extensive array of features, including charger and battery data management, the Battery Monitor and Identifier Module (BMID), precise charging control, electrolytic thermistor, our “easy-service” modular cable system, and our dynamic equalization scheduler that delivers weekly EQ compliance without assigning specific chargers to trucks. And like all PosiCharge chargers, the DVS100 works with a broad range of battery voltages and has the same data management and on-board intelligence.